Many certainly know the constellation Auriga, or the driver or, as it is called by my land “cart”. Those who name not sound, images sure you bring memories because, alongside Polaris (famous) is another of the most visible in winter. Located above the constellation of Orion, Capella is the star most often see or which tends to distinguish because it is the brightest of the entire constellation. In fact, it is not a star but a star cluster that joining its brightness and distance, eye mistaken for one. 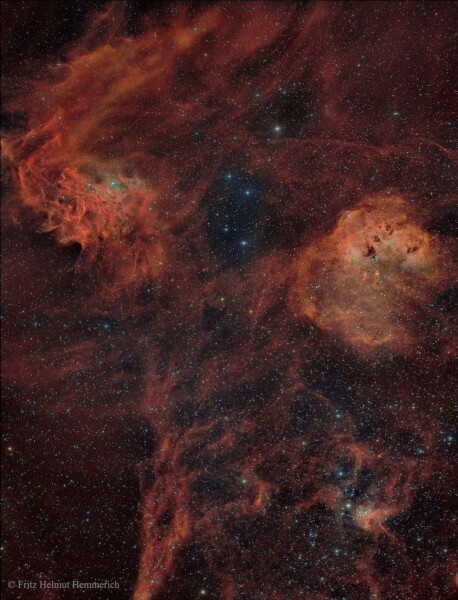 The two spots you see are the IC405 (left) and IC410 (right) nebulae. The IC405 is 1,500 light years while the IC410 is 12 thousand light years. These clusters are forming new stars that can only be observed through X-rays, with the red than gas, hydrogen, this pretty hot. In fact it is called “Flame Nebula”. Bottom right is the IC417 and NGC1931, usually called the spider and the fly about 10 thousand light years are nothing more than clusters forming young stars (they are there, yellow and recent).